Looking for a healthy snack? Try these kale chips which are both healthy and very easy to make. This cruciferous vegetable is very high in Vitamin K which is known to help or act as an anti-inflammatory. It has numerous other health benefits and if you are looking at eating a bowl of potato chips you might want to try this alternative. Kale might be a challenge to eat boiled or on its own but seasoned and crispy like a potato chip they disappear quickly and your family will be asking for more. Wash and thoroughly dry the kale. If you have a salad spinner this will help speed up the process. Remove stems (we slice down both sides of the stem) and cut the kale into 2 inch pieces. 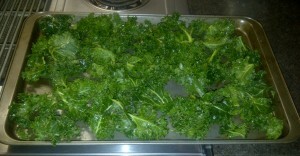 Toss them into a bowl and add a drizzle of olive oil…mix well ensuring all the kale have a nice thin coat of olive oil. Add sea salt and seasonings (Mrs. Dash is what we use) while in bowl or after laying them out onto the baking pans. Place them onto two cookie or baking sheets. Be sure to space them. Preheat oven to 275 deg F and cook the chips for about 20 minutes. Keep an eye on them and remove the pieces which are dry and crispy. Authentic Italian Cooking – What is it and how to? One cannot help but think that much of what we eat or recipes we see online are commercialized or have been tweaked to appeal to the masses or to the taste buds of the locals. To us, at Mamma Mia Recipes, true authentic Italian cooking or real Italian recipes are those that have been passed on from generation to generation. They use quality ingredients and the finished product typically cannot be purchased in grocery stores or even found in high end restaurants. Authentic means believed, trustworthy and reliable or true to its type. The only place most of us know where we can get true authentic recipes or cooking is at home and from Mamma. Generally, the taste might be region specific or may be slightly different depending on what part of Italy your family was raised in but the food is very similar and made with quality ingredients coming right from the garden. Mamma makes a minestrone soup certain times of the year with ingredients picked right from the garden earlier or usually the same day. That is what I am talking about! To capture that true authentic taste requires the same ingredients Grandma used to perfect the recipe so substitution of ingredients is usually not an option. Some Italian recipes require imported ingredients which may mean shopping at a specialty store that brings ingredients in right from the homeland. If you want authentic, we encourage you to find or use the same ingredients your Mom used when she made those tasty Italian treats. Welcome to Mamma Mia Recipes! Please stay tuned as we will be posting some of the best homemade Italian recipes you can sink your teeth into. Mamma Mia Recipes is all about Authentic Italian Recipes and the food we grew up on. This website is a small tribute to our Mother and related Famiglia’s … Mangia, Mangia! Mangia or Mangiare means to EAT! Grazie Tante is THANK YOU VERY MUCH! Chemente, Cemento or Concrete is not good ... RUN!